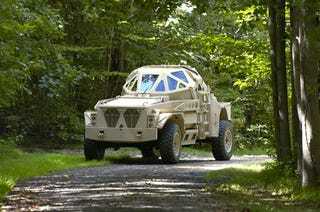 What Military Land Vehicle Do You Want As A Daily Driver? It's Veterans Day, and we honor those who serve (really, we should probably make it Veterans Year) by honoring the vehicles they drive every day and ask: what military land vehicle do you want as a daily driver. As excited as Siler is by the possibility of driving around NYC every day in an M1A1 with a bumper sticker reading "Free Driving Lessons" on the back, we're going with something we could actually drive every day. We've chosen the 4x4 Pinzgauer over other possibilities because a deuce-and-a-half is difficult to parallel park without "accidentally" crushing Mini Coopers. We'd go with the 4x6, but have you ever seen a valet manhandle anything with more than four wheels? It's like they've never competed in the Paris-to-Dakar rally before, or something. The Pinzgauer is all we need in a daily driver: a convertible on the nice days, a wagon when we've got people to haul, a truck when we've got lumber to haul, and an off-roader when we've got to escape the zombie apocalypse. Plus, it's great for meeting girls. Hey, lady, wanna see my Pinzgauer? In honor of the veterans, let us know what olive green vehicle you'd like to push around your patch of friendly soil.